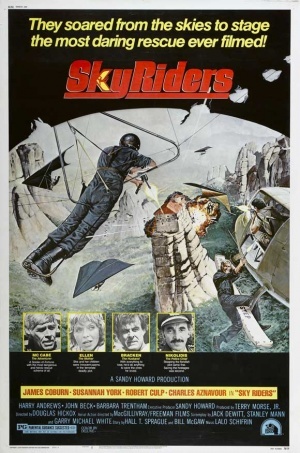 Sky Riders is a 1976 action movie directed by Douglas Hickox (Brannigan, Zulu Dawn). Robert Culp stars in the film as Jonas Bracken, a wealthy industrialist living in Greece whose wife and children are kidnapped by terrorists. Out of desperation, Bracken turns to his wife's ex-husband Jim McCabe (James Coburn). After it is learned that the terrorists are in a mountain-top monastery, McCabe hires a team of professional hang gliders to help him rescue the family. At the time of the production hang gliding was still new and a novelty. The rescue sequences were filmed in Meteora, Greece, where incidentally the finale of the James Bond film For Your Eyes Only was set. 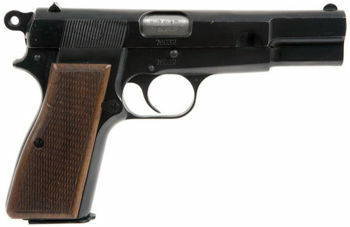 Both Jim McCabe (James Coburn) and the leader of the terrorists (Werner Pochath) use a Browning Hi-Power at the movie's climax. 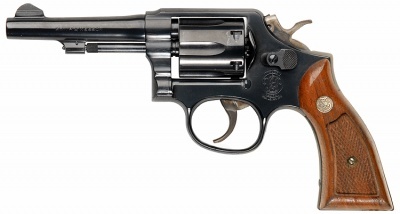 The Smith & Wesson Model 10 is used by the Greek police, Cora (Cherie Latimer), Rudy (Steven Keats), Ben (John Beck) and Martin (Henry Brown). Somewhat unusually the MP41 shows up in this movie. It is used by multiple terrorist to include the Leader (Werner Pochath) and Martin (Henry Brown). The Leader (Werner Pochath) at the beginning when carrying out the kidnapping. The MP40 is the most common firearm seen in the movie. It is used by the Greek Army, terrorists and Jim McCabe (James Coburn) and the other Sky Riders. Ben (John Beck) being stealthy. Jim McCabe(James Coburn) in a tough situation. Some of the submachine guns used appear to be MP38s. The weapon seen here appears to be an MP38. Possibly one of the earliest FPS/POV shots in movie history. Female Terrorist (Zouzou) fires at the Sky Riders. The Steyr MP34 is used by some of the Greek soldiers during the assault on the terrorist fortress. The Sten Mk V is used by Joe (Ernie Orsatti). One of the Sky Riders. Both the terrorists and the Greek Army are seen using the M3 "Grease Gun" during the battle. Jonas Bracken (Robert Culp) accompanies the Greek authorities when they assault the terrorist fortress. Interestingly he uses a Winchester Model 88 Lever Action Rifle and he is very effective with it. At one point he is shown as being the only person who is actually aiming his firearm. Later, at the conclusion , he hands it to his son. The Greek soldiers use a MG42 for fire support during the assault.